We all have the classic festivals such as Glastonbury, Tomorrowland and Carnival on our bucket list. But, there are so many more festivals to explore all around the world. Whether you are interested in the arts, becoming immersed in a new culture or dancing along to your favourite tune, we have you covered! Also known as the ‘World’s Biggest Food Fight”, this festival may seem wacky, but it is incredibly fun and was created purely for pleasure! Here, visitors of Bunol in Valencia throw tomatoes at one another for roughly one hour, painting the town red…literally! These tomatoes are provided that morning and arrive by the truck loads. To keep everyone safe, local authorities do ask participants to squash the tomatoes before throwing them to minimise the impact. This festival usually takes place at the end of August and tickets go up for sale well before this date so get in early! From food to drink, this festival involves throwing wine at one another (and in one’s mouth!) After climbing a mountain in La Rioja, everyone begins the festival until all the wine runs out. After this, stroll back down the mountain and join in with town dances, food and more wine! La Batalla del Vino (Battle of the Wine) is based in the quaint town of Haro and takes place at the end of June to celebrate St Peters Day. The festival itself is a week long and incorporates the mass and feast with plenty of entertainment for everyone to enjoy! This dazzling display of thousands of lit lanterns really is a magical site to behold. With limited tickets available to the inside event, this is one festival you need to organise early. Otherwise, thousands of people still observe the show from inland. Wherever you are, being involved is a truly unforgettable experience. Along with the lights, local monks also put on a display, lighting candles to represent buddha, after which they meditate adding to the serene atmosphere. This festival takes place during the twelfth moon; in line with the ancient Lanna Lunar Calendar. A slightly less known festival, this is also known as the ‘Mountain Roast’ – This is because the festival’s main attraction is the burning of the Wakakusayama mountainside overlooking the entire city. With a spectacular view from all over town, this festival won’t let you down. There are also many other forms of entertainment throughout the day such as giant rice cracker throwing, fireworks and a parade as they march to light the bonfire half way up the mountain. This festival started as the mountainside grass needed to be burnt back in early January every year but given the location, has become a popular tourist attraction. However, due to the outdoor nature of this festival, it may be delayed in the case of severe wet weather. Also a public holiday, this festival is widely celebrated throughout the country and is anything but morbid. It is the day of the dead which celebrates those who have passed on instead of mourning them, as this could be considered an insult. Here, you will find face paint aplenty, food, drinks, music, live performances, parades and more. You will notice as you wander the streets that even the portrayed dead are happy, so if you paint your face, paint a smile! This festival takes place on 1 November every year but is not the ‘Mexican Halloween’ so make sure you dress up in a respectful and appropriate manner. Lasting the month of August, this festival doesn’t mess around. It hosts thousands of performers from all walks of life to create a festival which really has something for everyone. In 2017 alone, this festival featured nearly 4,000 shows – so, get that coffee in you and get going, you won’t want to miss a thing! That aside, the town of Edinburgh itself is a magnificent medieval old town filled with monuments, memorials and hillside views overlooking the entire town. If you like the cold, this one’s for you – Set in the snowy hillside of Mayrhofen in Austria, this festival takes place every spring. Celebrating all snow sports, there are snowboarding competitions, slope stages, enchanted forests and igloo parties to keep you entertained! There is even a fancy-dress event for the most colourful and quirky snow wear you can find – it’s time to get creative! This festival is dedicated to sculptures of ice and snow in temperatures sometimes getting as low as -30 degrees Celsius! Harbin becomes an ice city during winter with thousands of sculpture enthusiasts gracing the streets and constructing snow statues for its 1.5 million visitors every year. There are a few different festival areas throughout this event – Ice Lantern Fair, Sun International Snow Sculpture Art Expo and Harbin Ice and Snow World. Each venue sells tickets separately so try and pre-book these to avoid the queues. This festival really showcases the best of Russia’s homegrown artists – There are many different events on during this month such as the long night of the museums (a one-night event where selected museums are open all night), ballet, opera, classical music and more. The most popular evening is called the Scarlet Sails and is set along the Neva River – A large vessel with red sails makes its journey across this river to wish new graduates a smooth voyage into adulthood! The river also becomes a kaleidoscope of colours with pyrotechnic displays for all to see. As this event occurs during the natural phenomenon known as the midnight sun, there is more to see than just the shows offered by the festival! Taking place from late May to late June, this festival is one not to be missed. 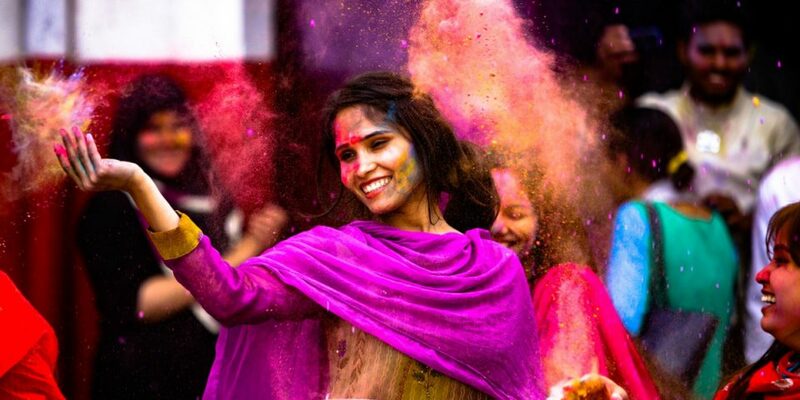 A holy festival, Holi takes place over a few days with the dye being thrown on the second day. Participants are covered from head to toe in water and dye with the colours representing something special and meaningful to Hindus; red represents love, fertility and matrimony, blue represents Krishna and green represents new beginnings. Even though Hindus believe all are equal during this day, be mindful that this is a religious ceremony and to not act in a disrespectful or demeaning way! This festival takes place during the Hindu lunisolar calendar month, usually during March! So, what are you waiting for? Why not start planning your next trip to coincide with a festival or two!